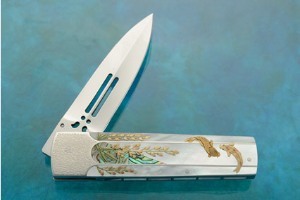 Description: Koji Hara's inimitable style has won him admiration from collectors and fellow makers alike. 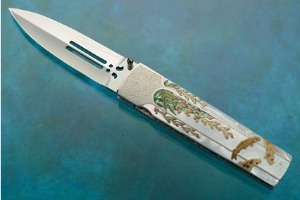 He consistently creates knives that are renowned for their precision, craftsmanship, and performance. 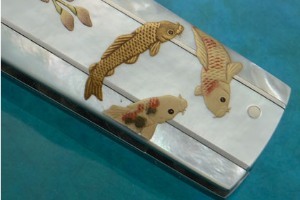 Golden Koi is among his masterworks to date. The steel Koji prefers is a powdered metallurgical steel not available in the United States, capable of a higher hardness without being brittle compared to American steels. Over the last few years, Cowry Y has become increasingly hard to find, even in Japan. The resulting blade has extremely good edge retention. The mirror polished surface is only possible though meticulous polishing with a tooth brush! The blade is pierced in a symmetrical pattern. 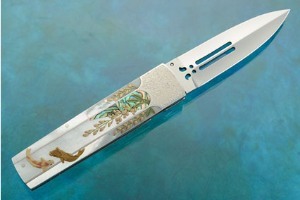 The well centered blade has excellent action, and is completed with a thumb stud inlaid with black lip mother of pearl. Each side of the stainless steel handle is inlaid with central sections of premium whitelip mother of pearl. 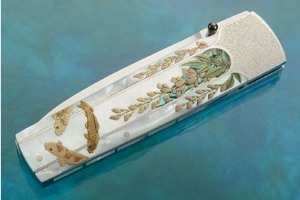 The mother of pearl is particularly dramatic, with dramatic flash and underlying texture. 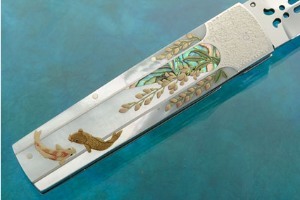 Each side is decorated with images of pond plants and koi swimming in the pearl water. The images are created using the Maki-e technique (literally 'sprinkled picture'). This technique, which was developed during the Heian Period (794-1185 CE), involves Japanese lacquer sprinkled with gold powder using a kebo brush. The result is a tremendously detailed, lifelike image that can be created in no other way. Maki-e objects were initially designed as household items for court nobles, though they were soon adopted by royal families and military leaders as a symbol of power. 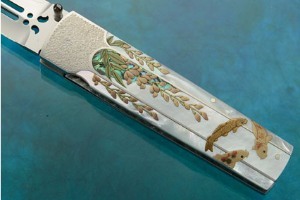 The front bolster is enhanced with tsuchime, or a hammered finish, on the metal. 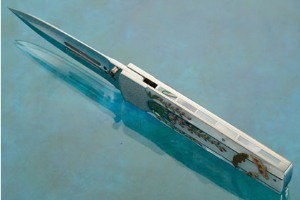 The mirror polished stainless steel backbar is inlaid with five sections of mother of pearl and a section of abalone. 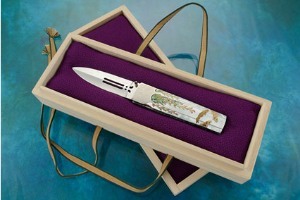 The knife is accompanied by a padded kiriwood presentation box.